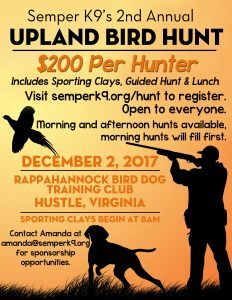 Quantico, VA- Semper K9 Assistance Dogs, a combat veteran founded and operated veteran service organization, has announced its 2nd Annual Upland Bird Hunt. This year’s event will be held in Hustle, Virginia at the Rappahannock Bird Dog Training Club on December 2nd. “Last year we raised a little over $3,000 with our first event,” said Executive Director and Co-Founder Christopher Baity. ”We are looking forward to this year’s event which will give us an opportunity to accept more hunters.” Funds raised will go towards Semper K9’s Facility Fund. The non-profit recently purchased 33 acres that border Marine Base Quantico on its north-west perimeter. Registration, which is now open, is $200 which includes a guided hunt, clay shooting and lunch. Those interested in supporting the event can also sponsor a disabled veteran to attend the hunt at no cost to them. One hundred dollars of the registration for hunters is tax deductible. All sponsorships are tax deductible. Raffles are also being collected as well as swag items for registration bags. To find out more about Semper K9 including how to sponsor the event, donate raffles, please visit their website at www.SemperK9.org or email amanda@semperk9.org. About Semper K9 Assistance Dogs: Semper K9 Assistance Dogs is a combat veteran founded and operated 501(c)(3) nonprofit that provides assistance dogs for wounded, critically ill and injured members of the U.S. Armed Forces and their families. Christopher Baity, Semper K9’s Executive Director, is an OEF/OIF combat veteran Marine Corps dog trainer and kennel master with three combat deployments, one civilian deployment and two additional overseas deployments with military working dogs. To learn more about Semper K9 at www.SemperK9.org and follow them on social media: @SemperK9.